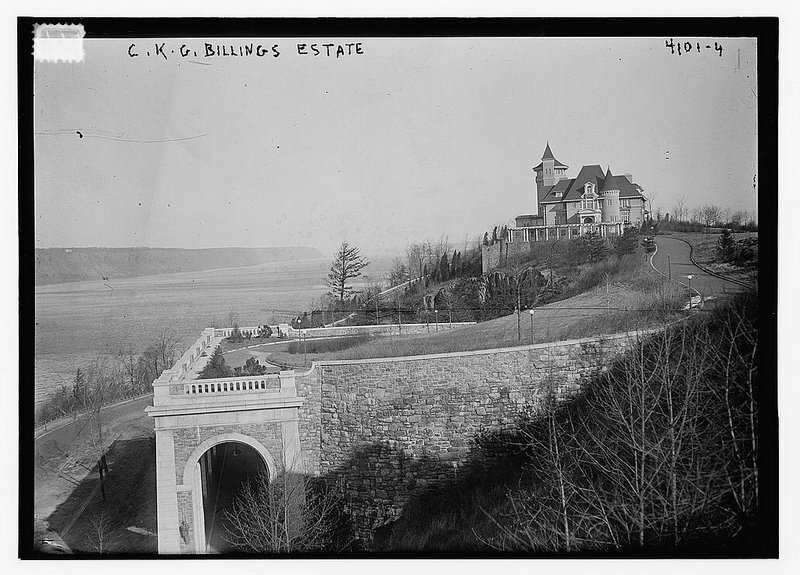 With over $2 million lying around, Cornelius King Garrison Billings (1861-1937) built an estate overlooking the Hudson River that fit right into the excessive culture of the Gilded Age. Completed in 1907, the Billings estate on Fort Tryon at Washington Avenue and Riverside Drive, was originally meant to only be his summer dwelling and included a bowling alley, a heated indoor swimming pool, and a maple squash court among the living quarters. After inheriting wealth from his father’s company, the People’s Gaslight and Coke company of Chicago, over which he eventually presided, Billings retired at 40 and moved to New York City. In 1901, he purchased 25 acres on 196 Street, which is now Fort Tryon Park. For $200,000, Billings commissioned architect Guy Lowell (who also created the Tweed Courthouse) to design a 25,000-square-foot stables for sixty horses that included exercise grounds for them and a casino for human entertainment. Most of the photos in this article are from a book published by C.K.G. Billings, providing an inner look at the estate, which were shared on the website myinwood.net. Soon after finishing the stables in 1903, Lowell started designing an estate for the millionaire and his family in the lavish style of Louis XIV. Completed in 1907 and named Tryon Hall, it included 21 rooms and was centered around a courtyard of flowers. Since the mansion was 250 feet above the Hudson River, the Statue of Liberty could be spotted from the observatory. To keep up with all the chores and maintenance, Billings had 23 live-in servants. In 1913, construction started on the driveway that Billings stipulated be on a low-grade, 100-foot incline on which his horses could safely walk. Unable to realize Billings’ vision on his own, Lowell turned to General Nogi, a Japanese commander known for his military engineering, to design the driveway. The final design, which cost $250,000, was a 1,600-foot ‘S’ shape that sloped at a 6-degree grade and ended 100 feet above the ground. Over the course of a year, 100 laborers built the driveway by cutting into the bedrock with derricks. With the granite removed from the cliff, the laborers constructed the Roman-style retaining wall and arch viaduct. Actually, these arches are the only remains of the Billings estate. Check out Untapped Remains of Fort Tryon to see photos of what it looks like today. Despite his extravagant surroundings, Billings didn’t enjoy living in Upper Manhattan so in 1917, only 9 years after construction was completed, he sold the property to John D. Rockefeller, Jr. for $35,000 per acre. Rockefeller planned to turn the property into a park for the city. He even bought the land right across the Hudson River in New Jersey to preserve the gorgeous views. But Rockefeller’s plan did not immediately come to fruition. He first faced opposition when architects heard of his plan to demolish the magnificent estate. Some New Yorkers proposed to use the building as the mayor’s estate or a city museum, but Rockefeller refused to compromise on his original park plan. As the United States entered World War I, Rockefeller decided to temporarily give the building to the United States government to be used as a hospital. He was even prepared to spend $500,000 to make alterations to the mansion, but the patriotic plan fell through. Since Rockefeller was in the early planning stages of his park, he decided to rent the grounds to Nicolas C. Partos, head of the Partola Manufacturing Company, for the summer of 1918 at $25,000 per month. The original 5-month lease was extended for 8 years, but abruptly ended when the estate caught on fire. Although Billings had installed a fire-fighting system, it failed at its first trial. Rockefeller started transforming the 67-acre property into a park in 1927 after hiring the Olmstead brothers of Central Park fame as architects. Because of the rocky terrain, the park wasn’t completed and presented to the city until 1935. In 1983, city officials designated the park as a city landmark. Ironically, what was once a display of private wealth and utmost excess now serves New Yorkers as a public space overlooking the Hudson River.